The average 100 litre fish tank measures around 3.65 square feet and can healthily maintain 3 marine fish of around 3 inches in length. 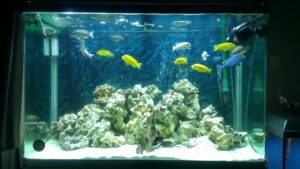 This may seem a very small amount of fish for an aquarium and it is, but from a beginner marine fish keeping point of view it is a really good place to start. When setting up a marine tank it is important to realise that the healthy set up and upkeep is quite specific. One of these specifics needed is live rock and it is not recommended to set up a marine tank without it. Live rock provides a natural source of filtration for your tank. It is important to understand that live rock does not actually mean rock that is alive, but that it is natural rock that has been gathered from the ocean floor. Small pieces of rock break off from larger rocks all the time and this is what is collected and placed in tanks around the world. The live part in the title actually refers to macroscopic and microscopic marine life that dwells within it. These include: algae, sponges, macro algae, coralline, worms and shrimps. Real reef eco-friendly live rock which comes in a variety of colours such as green, purple or red. The cost of this variety is around £115. Fiji standard live rock which is available in purple or red and costs around £60. Fancy fused live rock which you can buy in green, purple, red and yellow. Average cost is around £80. Reef rubble is the cheapest option at around £35. It comes in green, purple and red. With the variety of colours and different varieties available it is impossible to create anything other than a beautiful vibrant display with live rock. It may be a necessity but it is also surely a thing of beauty you couldn’t resist anyway.